Kate Brownlee Sherwood was an American writer of poetry and short stories as well as being a journalist and philanthropical patron of the arts and literature. In 1883 she was one of the founders of the Woman’s Relief Corps, an organisation set up after the American Civil War. 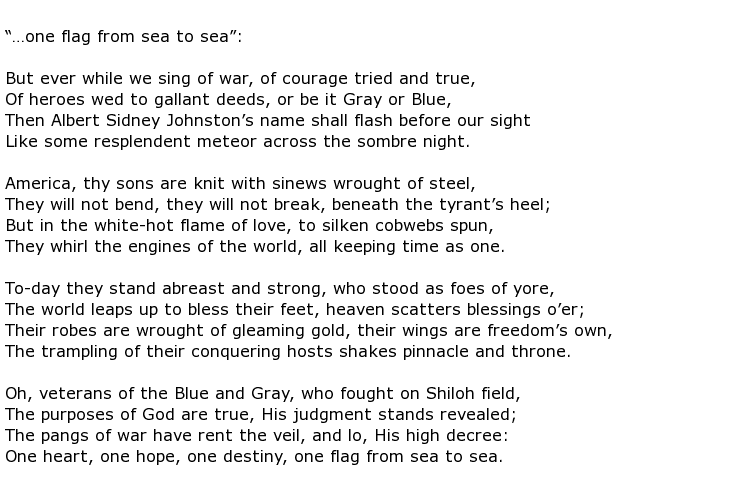 Much of her poetry centred on military subjects, her most famous being a memorial poem called Albert Sidney Johnston, in honour of the Confederate General who was the most senior officer to fall during the Civil War. She was born Katharine Margaret Brownlee on the 24th September 1841, probably in the small Ohio settlement of Poland. Her father was a judge whose ancestors had emigrated from Scotland during the early part of the century. Katherine went to school at the Poland Union Seminary but seemed to have no great academic ambitions, marrying a man named Isaac R Sherwood when she was just 18 years old. One of her husband’s interests was the editorship of the Daily News-Democrat, a newspaper in Canton, Ohio, and she was determined to learn the business from top to bottom. While living in Washington, due to her husband’s service as a congressman, she wrote pieces for several Ohio journals. 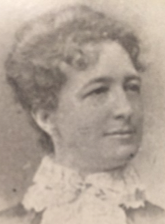 They moved to Toledo in 1883 where her journalistic career continued but she also became involved in the establishment of a national congress for women. She was busy writing though and her first collection of poetry came out in 1885 under the title Camp Fire and Memorial Poems, a very popular publication amongst military readers. She was frequently invited to recite poetry at military reunions, remarkably being the first northern poet to do so at Confederate gatherings. Her famous poem Albert Sidney Johnston received particular attention amongst many others, notable examples being The Men who Wore the Shield and A Soldier’s Retrospect. This piece of work was initiated to correspond with the unveiling of an equestrian statue to the fallen General which was first seen on the 6th April 1887 in New Orleans, 25 years after Johnston’s death. It was read out in full to the admiring throng and was described as a “graceful tribute to him and our heroic dead” by the organisers of the unveiling. Sherwood had been a student of German and French in her younger days and she used her language skills to translate many German pieces, such as the work of Johann Wolfgang von Goethe and Heinrich Heine, amongst others. Further collections of her own poetry included Dreams of the Ages; a Poem of Columbia, published in 1893 and Guarding the Flags (1890). Her philanthropical work included major involvements in organisations such as the Grand Army of the Republic, the Woman’s Relief Corps and the National Home for Army Nurses in Geneva, Ohio. Kate Brownlee Sherwood died at her Washington D.C. home on the 15th February 1914 at the age of 72.